Corralling young athletes on picture day can take an entire team of skilled team coaches and parents. Legends Event Photo is on a mission to make the process easier for little sluggers and their biggest fans by simplifying the scheduling process with SignUpGenius. Legends Event Photo is based in Clinton, Tennessee, and provides photography services across the state, along with north Alabama and parts of Kentucky. Its primary focus is youth sports photography, but the company also works with schools and other organizations. Features that Cook says have been most helpful include automatic reminders, which have helped increase participation rates, and SignUpGenius’ mobile web app. 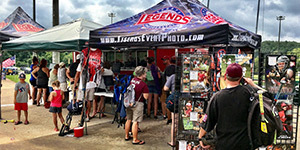 Legends Event Photo also uses SignUpGenius to collect money for advance deposits so that customers can secure photography services. “This feature allows us to increase our on-site revenue and also keep a detailed list on those customers who have paid and signed up,” Cook says. Cook says he saw an increase in business after the organization began using SignUpGenius to organize photo shoots about a year ago.